Edward discovered dinosaurs when he was really little. His interest in dinosaurs really took off when we went camping in Brittany one year. To keep Leila and Edward amused on the journey I had bought some sticker books. I got Edward one all about dinosaurs. That book, packed full with detail about dinosaurs really captured his interest. He spent hours of that holiday looking at the pictures, asking me to help with the stickers and read all the text again and again. That got the ball rolling and we learned about the types of dinosaurs; brachiosaurs, diplodocus, tyanaraouruas rex, stegasauraus, triceratops, velociraptor, pleisiosaurs and lots more! 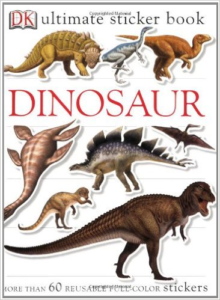 He would spend hours laying his top trump dinosaur cards out in different rows, according to their size, their weight, the time period when they emerged, the time period when they became extinct. He learned about different theories of why the dinosaurs died out and about prehistoric creatures that existed before them. He knew more than I can write because I didn’t keep up. I didn’t have sufficient interest in the subject and I certainly don’t think I had the memory to store so many facts. I spent many evenings reading him dinosaur related information. I hardly ever got to read bedtime stories, he simply wasn’t very interested in these. I read him long lists of dinosaur names and facts. At times it was incredibly boring for me, I would have loved to have read him a children’s book. I have to say that it was a great relief when he did start to read these books by himself! Every Christmas and birthday from the age of 3 to 10 Edward received predominantly dinosaur related presents. I think some friends and family thought that we should be getting him other things to try and expand his interests. They very generously gave him gifts which we all thought he might be interested in; a chemistry set, a telescope, a planetarium kit and so on. I am afraid that they all just gathered dust. His only interest was for his beloved dinosaurs. When Edward was about 10, Nick heard that there was going to be a talk about the KT Transition Event at a local cafe. That meant nothing to me, but apparantly this is one of the leading theories as to why the dinosaurs died out. Nick thought that Edward would be interested, so he took him along. They found themselves with a bunch of mainly retired academics, sitting eating cake, listening to a professor from the university. Edward is not shy and this was a dream situation, real life experts talking about his special interest. He asked appropriate questions and gave his opinion about things. At the end of the event the professor said to him, “I can see you are very well read on this subject” to which Edward replied, “No I am not, I have just watched a lot of Youtube videos about this”. At the time I thought Edward was on track to become a palaeontologist but rather abruptly at 11 he announced that he thought his interest in dinosaurs was waning. He had new interests that were demanding his time. Learning about dinosaurs gave Edward a tremendous amount of pleasure. At times It was all consuming but he loved it and it relaxed him. Tony Attwood recommends allowing autistic children to pursue their special interest in depth. If they can become an expert in a particular field then that can make them very employable in a niche role. Any difficulties with social interaction being compensated by high levels of expertise. I think neurotypicals (non autistic people) may feel that a special interest veers into the territory of unhealthy obsession. But what is actually wrong with it? Sure, you need to help your child work out when it is okay to talk about their special interest otherwise they will bore people to death (here’s how we tried to do this), but letting them get really deeply into a subject is surely how experts are formed. When I started working as a speech therapist back in the 1990’s I worked with an autistic boy who was in mainstream school who had a special interest in feet. He really just wanted to talk and think about feet. This had been deemed an inappropriate topic by school staff and as a newly qualified therapist with no experience of working with autistic children, I followed the plan. If he mentioned feet we tried to get him off the subject. I regret that now. I think he would have been so more motivated if we could have used his special interest to help him reach his language and teaching goals. If you think about it, feet are kind of interesting, there’s a lot you could cover; anatomy, muscles, bones, footwear, injuries, foot diseases and treatments, history of shoes, feet in art and so on. I would have used his interest as a reward. Teachers often reward children by giving them free time or extra outdoor play time if they complete work quickly. This is unlikely to motivate an autistic child as unstructured parts of the school day can be the most problematic. Towards the end of primary school, after some input from the local autism support team, Edward was allowed to spend time on a computer by himself in the class room if he completed an agreed amount of work. This made school lessons work much better for him and I think also for his teacher. I often find myself thinking about that boy who liked feet. I hope his parents let him pursue his interest at home. I really hope he had a chance to meet a podiatrist! Photo courtesy from Greg Pye, flickr creative commons. I recently read an amazing story about a mum of an autistic teenage boy. Her son, Dylan, had been fascinated by vacuum cleaners from the age of 2. The American Kirby vacuum cleaners to be precise. Dylan knew everything about them, the different models, the different features, the pricing… the whole shebang. For his 14th birthday party his mum asked Kirby if they would be able to send a trainee salesman to come and do a vacuum cleaner demonstration. She explained that Dylan was autistic and that he had been fascinated with Kirby cleaners for many years. 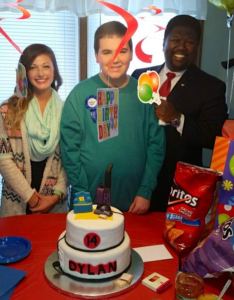 The company sent one of their top salespeople and they even gave Dylan a brand new, top of the range Kirby as a gift! Brilliant! Now, I don’t know what Dylan will do in the future but I wonder how many companies would like employees who are able to process, remember and compare detailed information about all their products? Programmes like Employable Me shown earlier this year on BBC2 have helped raise awareness about the skills that autistic people have to offer. Only 15% of autistic adults are currently in paid work. I hope that with more awareness and understanding about autism this figure will dramatically improve, and quickly. Here’s the link for the wonderful story about the vacuum cleaner party. Check out the amazing cake! It has a Kirby Vacuum cleaner on it! I’d have struggled with the special interest in feet, Lynne! Lovely story about the vacuum cleaner though. I read about a child whose special interest was yellow pencils which I think would have been more challenging than feet! There is room for people who think differently and infact I think as a society we really need autistic minds.